Monday afternoon to Friday am. Course FULL- places available on 'Spring Colour' 3/4 nights 11-14 or 15 April, or Spring Combined 8 nights 11-19 April. 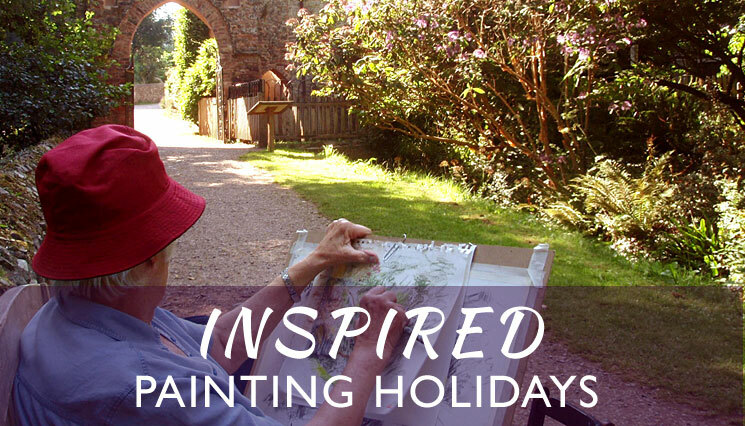 A Painting Break in beautiful Devon, learning to sketch and paint spring gardens or scenery. In late April, early shrubs, fruit trees and azaleas in gardens have fresh spring foliage and flower colour, and spring flowers are showing in borders and countryside. This studio and location based course covers colour mixing for spring scenes in gardens and landscape, with individual or small group help with particular painting skills as well as sessions to develop key skills including sketching, tonal values, composition, negative painting and colour mixing. Bring your chosen painting medium and portable sketching materials for outdoor work. We will visit one of Devon's beautiful gardens with particular spring landscape interest to practice our skills. Materials Please bring sketching materials and your chosen painting medium. Also recommended- protective clothing for painting, suitable footwear and clothes for outside, including waterproofs. Digital camera. Folding stool if needed. More detailed information about materials and equipment is sent out shortly before the course- you may already have all you need, but contact the artist if in any doubt. Accommodation and travel. Courses are based at the Artist's house and Studio in Bampton, near Tiverton, Devon. The holiday is fully residential in our AA 4 star accommodation,and holiday cottage, and includes 4 nights single occupancy accommodation, breakfast, evening meals and lunches except on days out. The non-resident price includes all meals as above except for breakfast. Bampton is 12 miles from M5 junction 27 and from main line train services at Tiverton Parkway, with direct trains to many locations (e.g. London Paddington- 2hours, Birmingham New Street 2.25 hours). We can arrange to collect students travelling by train or coach from Tiverton Parkway Rail Station or Tiverton Coach Station.